Enzymes are fundamental to life as we know it. These tiny molecular machines are outstanding catalysts that are often much more efficient than the artificial catalysts chemists know how to prepare. Consequently there is intense interest in understanding how enzymes work. Hopefully this will help chemists prepare better catalysts to change the way we live. Some principles of enzyme mechanisms are well understood. For instance, the transition state of a reaction, a short-lived species that connect reactant and products, is typically preferentially stabilised by electrostatic interactions in the enzyme's active site. An interesting complication is that enzymes are also flexible molecules that naturally undergo a range of motions across different timescales, from very fast bond vibrations on femto- to picosecond timescales, to slower 'breathing motions' that propagate across the whole molecule on millisecond timescales. 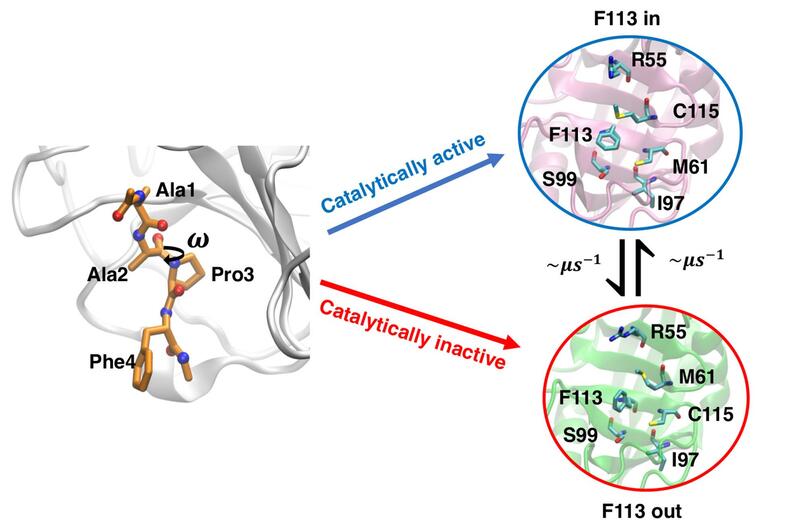 Since some of these motions may change the shape and properties of the active site, motions can influence the catalytic efficiency of the enzyme. This has led to much debate about the type of motions that are important for catalysis, and on what timescales they occur. In this work we were interested in the enzyme cyclophilin A. Cyclophilin A is a well known drug-target because of its implication in viral diseases such as HIV or the hepatitis C virus. The drug Cyclosporine, an immunosuppressant given to patients that undergo organ transplantations, is a well known inhibitor of cyclophilin A. Cyclophilin A has also become a model system for studies of relationships between protein dynamics and catalysis. In particular cyclophilin A has previously been shown to undergo specific motions on a millisecond timescale, and there has been much debate about how these motions may or may not be important for the catalytic activity of this enzyme. One reason the debate could not be resolved is that the previous measurements did not explain precisely what the millisecond timescale motions looked like. This is because it is difficult to measure with atomic resolution molecular motions in enzymes. To overcome this challenge, we used computer models to simulate the motions of cyclophilin A and a panel of mutant variants. We also simulated the chemical reaction that cyclophilins catalyse using different shapes of the active site observed during our simulations. We found that our simulations could reproduce well the changes of the shape of the active site of cyclophilins observed previously by X-ray diffraction experiments. Our models could also reproduce well the differences in catalytic activity of different variants of cyclophilin A. However, what was surprising is that the differences in catalytic activity between cyclophilin A variants were due to a conformational change that occurs on a nano- to microsecond time scale. This is 5 to 6 orders of magnitude faster than the time scale on which motions critical for catalysis had been previously suggested. Our models therefore suggest that previous studies linking millisecond protein dynamics to function in cyclophilins may have overlooked important functional motions occurring on nano to microsecond timescales. This has important implications for catalysis research as different methodologies have to be developed to probe molecular motions on different timescales in enzymes.